Macedonian Kingdom, Alexander the Great, 336 to 323 BC. Silver tetradrachm. Struck long after he died. Date : ca. 173 to 167 BC. Size : 30.4 x 33.0 mm. Weight : 16.58 grams. Grade : gVF with a very fine style reverse, on a very broad flan. Reverse : Zeus seated left, holding a sceptre and eagle, with ALEXANDROY to the right, and pegasus flying left below his arm, and an E below the throne. 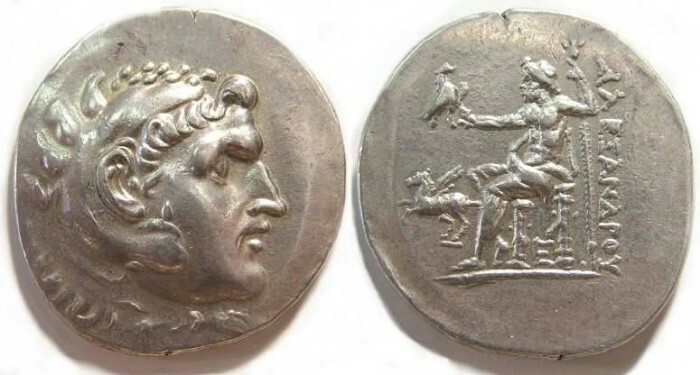 The reverse on this coin is one of the most attractive I have seen on any Alexander III tetradrachm.